It’s a potent blend of three plant stem cells, known for their renewing properties. Edelweiss known for its protective properties, sea holly, known for its firming properties and criste marine recognized for helping natural skin renewal. Youth may be a mindset, but there comes a time when unfortunately our skin doesn’t look as fresh and youthful as it used to, not quite reflecting how we feel inside. 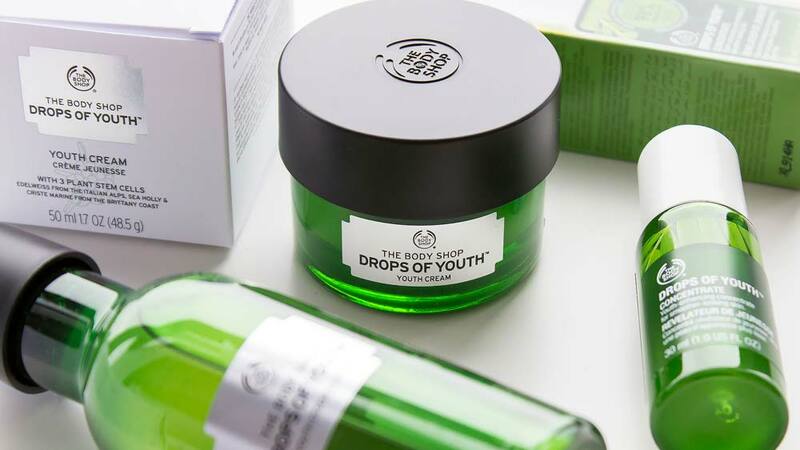 To fill this gap of inadequate supply of skin nourishment, The Body Shop has introduced a velvety-smooth, delightfully light whipped Drops of Youth cream. “We think it’s a pretty good substitute while we continue searching for the fountain of youth… and the power behind our Drops of Youth Cream? A potent blend of three plant stem cells, known for their renewing properties. Edelweiss known for its protective properties, sea holly, known for its firming properties and criste marine recognised for helping natural skin renewal,” said The Body Shop Spokesperson. Use it every day in your skincare regime after applying serum, and before applying make-up or simply go fresh-faced. You’ll soon see – skin is quenched with moisture, lines appear smoothed and skin looks healthy, rested. Its best-selling serum (1 sold every 23 seconds!) has been infused with the same potent blend of 3 plant stem cells as with the latest innovation, Youth Cream. A quickly-absorbed, non-sticky concentrate, that leaves your skin feeling instantly softer. • Edelweiss plant stem cells possess renowned skin renewal properties. 3.Youth Bouncy Sleeping Mask: Discover our new Drops of Youth™ Bouncy Sleeping Mask, enriched with Edelweiss stem cells. Designed to be left on overnight, it leaves skin looking bouncier and feeling replenished. 4. Wonderblur Youth Smoother: This lightweight product blurs instantly and smoothes skin texture, visibly reducing fine lines and pores for an even, flawless finish. Moderately priced between Rs 1,995 to Rs 3,695 and available at signature outlets and leading retail stores across India. About Us: With renowned success of Above & Beyond and Patch..
Want to be financially Independent? Want to work with convenience..
About Us: Founded in 2016, Fanusta.com is a curated marketplace of..
About Us: GD Goenka Group, established in 1982, has had varied.. Creating healthy Environment for Special Kids..
That’s So Ramyun! A New Food Trend..
Business That Takes Care of Cars like Babies..
Kiosks: Small Formats, Big Profits.. Franchise Ideas For The Food Capital Of India.. Emerging Role Of Tech In Business Education.. Enhancing Creativity with Technical Skills.. List of Three Essential Yoga Practices in Nepal..
Do not Limit Your Income to Job..
How Pune is turning into Health-Tech hub..
Business Ideas to Look Out for in 2018.. Catering to the Need of the Millenials.. Rising Demand Of Virtual Clinic in Schools.. Growing Wave of "Learning by Doing"..
Chartering the path in Automotive Industry..
Start A Dog Training Business..
Trends In Luxury Fashion Industry..
Varying colours of the spalon industry..
10 Reasons to Buy A Franchise..
Four Key Advantages of Franchising.. Does Branding Help in the Growth of Business?.. CDR or QSR, What to Choose?..